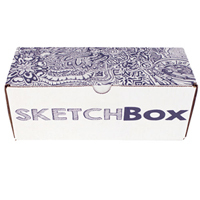 So what normally comes in a SketchBox? Wonderful tools like Copic Markers, Koi Watercolors, Montana Acrylic Paint Markers, Alphacolor Pastels, Caran d'Ache Luminance Colored Pencils, Charcoals, Graphite Sticks, Gum Erasers, and other materials and mediums for you to explore. Each month has a theme and is meant to allow you to try a new medium. Every box also includes an exclusive how to video to follow along with and learn. What doesn't come in a SketchBox? 3D mediums like clay, sculpey, or pottery supplies. For $25 a month you'll receive hand-picked art supplies and an inspirational piece of art from our featured artist. This is a great introductory box for those looking to try new art mediums, materials, and tools. For $35 a month we'll send hand-picked PREMIUM art supplies and a piece of art to inspire you. This box contains higher quality fine art supplies. If you want Copic products for example, this is the box for you. SketchBox LLC © 2018, All Rights Reserved.